Raheem Sterling and Mohamed Salah are both playing major roles in the Premier League title race this season – but who has had the most impact so far? With just five matches to go in the title race, Manchester City are two points behind Liverpool but with a game in hand. On paper, City have the tougher run-in, with matches against Tottenham and Manchester United still to come. However, their destiny is in their own hands and they know that five wins will see them lift the Premier League title. 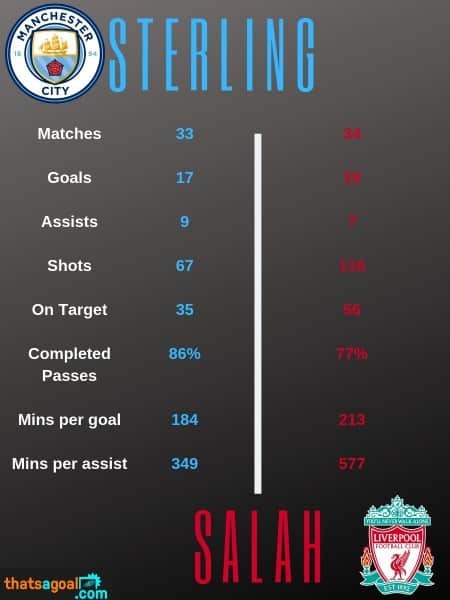 Two of the biggest players in the title race this season have been Manchester City’s Raheem Sterling and Liverpool’s Mo Salah – both scored vital goals in the weekend matches and their head to head stats make interesting reading. Salah has played one game more than Sterling this season, and in total he has played 4039 minutes in the Premier League, compared to the 3137 Sterling has played. This is largely due to Pep Guardiola’s rotation of his players and the talent at his disposal. Mahrez, Bernardo Silva and Leroy Sane are regularly swapped with Sterling as City continue to challenge on four fronts. Salah’s goal against Chelsea took his tally to 19 for the season and he’s also registered seven assists. Sterling scored twice against Crystal Palace earlier in the day to get to 17 goals. His best season tally so far is 18 in 2017-18. Salah’s goal tally has included three goals from the penalty spot this season, where as Sterling doesn’t take the Manchester City spot kicks. 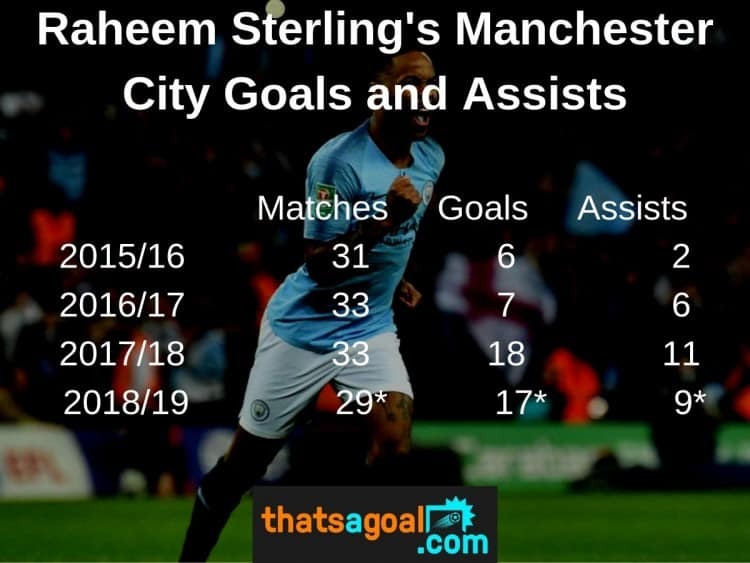 All this means that Sterling has a much better minutes per goal ratio, averaging a goal every 184 minutes played, almost a one goal in every two games record. Salah is operating at a rate of 213 minutes per goal. The Liverpool winger has had a lot more shots on goal, and on target, with 116 attempts and 56 of them finding the target. Sterling has only had 67 shots in comparison, finding the target on 35 occasions. This means almost half of his shots on target result in a goal. Will this be Sterling’s best every Premier League season? Although all of Raheem Sterling’s focus will be on winning the Premier League, FA Cup and Champions League to complete the quadruple, he is just one goal away from his best ever return in the Premier League. With five matches remaining, he will want to try and beat the 18 goals he scored in the 2017/18 campaign, however rotation with the Champions League in mind could halt this. Whatever happens in the title race – there is no doubt that both Sterling and Salah have played their part this season. Porto vs Liverpool preview and betting tips. Is there any hope for #FCPorto tonight? #LFC will want to avoid any mishaps and get the awat goal. 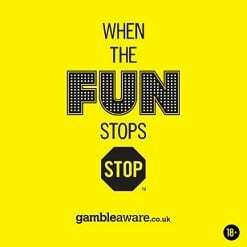 Bet £1 on #LFC to win £30 if they beat Porto tonight. (T&Cs apply. New customers only. 18+).